But this looks nothing like Helen to me! Posted on June 19, 2009 at 3:30 pm in Hindi film history, Hindi movies, Vintage Bollywood images	| RSS feed You can skip to the end and leave a reply. What fun! 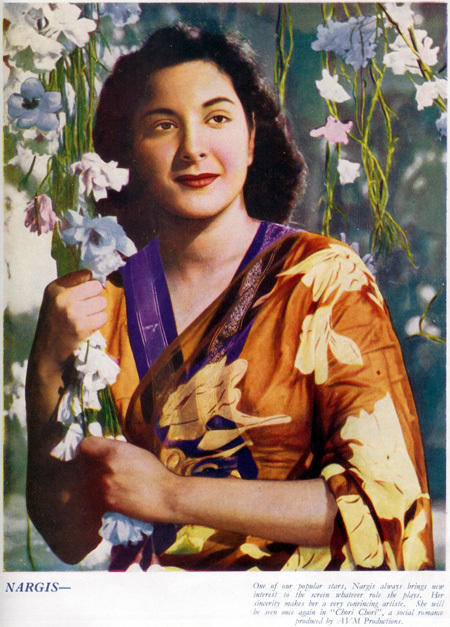 Love the Nargis picture, especially. Im thinking Issac Mizrahi dressed them all. His color palette! Exactly that. I think I am totally project runwayed out! Nargis is really gorgeous! Vyjanthi too. I don’t think that is really Helen! Face does not seem to match. I dont think helen wore such skimpy clothes ever ! The Vyjyantimala and Shashikala pictures look the most real. I think even Nargis’s photo looks a little off – especially her eyes. And Helen is oh so not Helen. The eyes, yes; the smile no! Whatever. Realistic or not, they’re all lovely pics. Thank you! It is true Helen looks quite different than her usual self, but a pose and an angle can change a lot in photography! Thanks for these glorious fotos and for sharing! 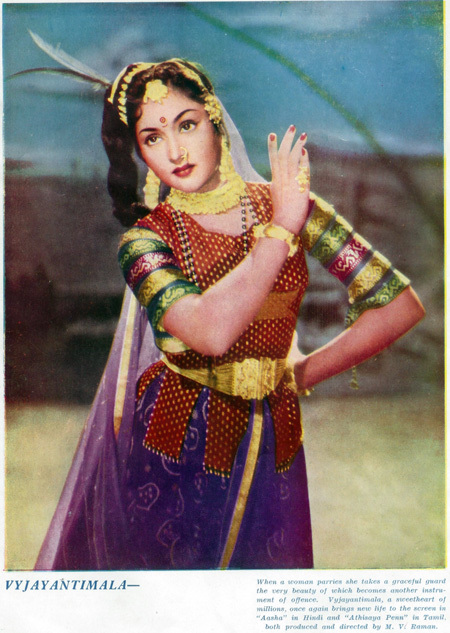 Shashikala’s is definitely a hand-coloured photo, perhaps also Vyjyantimala. The other two, I’m not sure at all! It does not look like Helen to me either. Your readers include somebody who knows everything, sooner or later, so I’m looking forward to somebody coming and saying who it might be. When color printing was much more of a big deal (for example, these mags have two pages per issue total), I think there were many many more steps involved in getting color pix into a magazine, which magnified the likelihood of a caption and a photo no longer being true mates by the time of publication. I’m just thinking that the wrong captions in a big recently published Bollywood-history coffee-table book I have may be due to this fact – if older photos were obtained from old magazine photo files without somebody checking on all of this. Anyhow Memsaab, hope you keep these coming, they brighten days which are needing it. They have certainly brightened my otherwise rainy days :) I think it isn’t a typo—there are only two color plates in each magazine (the rest except for the cover is black and white) and it definitely is meant to be Helen. She was only about 17 when this came out too…I think it’s more likely a bad coloring job or a bad drawing, one of the two. But certainly it does not do Helen’s beauty justice! Thank you memsaab. Gorgeous pictures. Shashikala looks the most authentic. Lovely pics. Are they Technicolor? Or Eastman color? 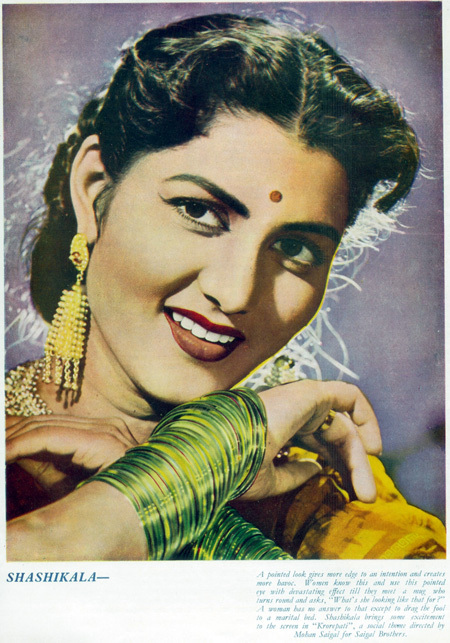 :-D I had no idea Shashikala was acting that early in the 50s! Face looks too round and full in Helen’s picture. But who knows, that is how she may have looked those days. And perhaps she is looking different because she is posing in the style of some western actess- Marylin Monroe or some one ? would you mind if i borrowed one of these images for a flyer? haha… thanks!!!! you’re great .. i LOVE this blog. my flyer is also posted on that blog. thanks again! Wait, was Helen living with P.N Arora in 1956? I thought they got married in the 1960’s. The description inside Helen’s photo is kinda creepy. Yes she was living with him from early on in her career, and left him in the early 70s (discovering that he had been spending her money over all that time, making her practically destitute). I don’t think they ever got married, PN Arora was already married.